Uveal melanoma is the most common primary intraocular tumour, but at the same time infinitely less frequent than cutaneous melanoma. Clinical advances, largely using some form of radiotherapy, during the last decades have resulted in a majority of eyes with uveal melanoma now being retained with some visual function. Alas, this has not been paralleled by an improved survival; indeed nearly half of uveal melanoma patients still die with metastatic disease. To improve survival, we would need to be able to identify individual patients, rather than groups of patients, at an increased risk for subsequent metastatic disease. Also, we would need to improve our skills to defeat metastatic disease and this probably includes earlier detection of metastases and a much more effective therapy. Because such therapy ideally should be targeted to melanoma cells, novel insights in the early tumorigenesis of uveal melanoma and mechanisms of relevance for tumour seeding are vital. 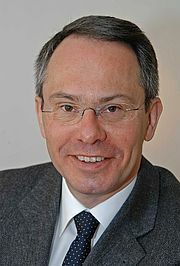 In this aspect we have in recent years taken an interest for targeting tyrosine kinase receptors. 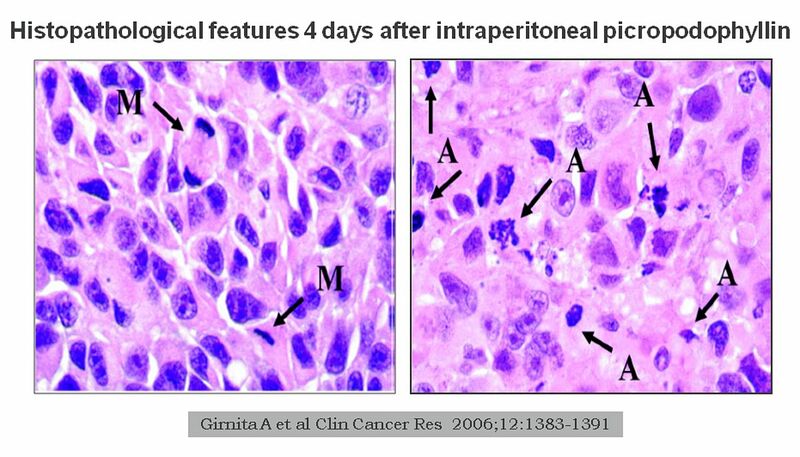 Some years ago, it was found that the c-kit receptor that can be selectively blocked by imatinib (marketed as Gleevec or Glivec) and that this induces a dramatic response in patients with gastrointestinal stromal tumours. However, the pendulum has swung back and more recently it appears that resistance to imatinib may develop and that long-term prognosis is somehat less favourable than initially thought. Interestingly, the c-kit receptor is present in a strikingly large proportion of uveal melanoma (in contrast to cutaneous melanoma) and in vitro data indicate that uveal melanoma cells in culture promptly responds and regresses after treatment with imatinib. Unfortunately, this does not translate into clinical effectiveness, possibly because activating mutations in the c-kit receptor is an uncommon finding. Fig 1. 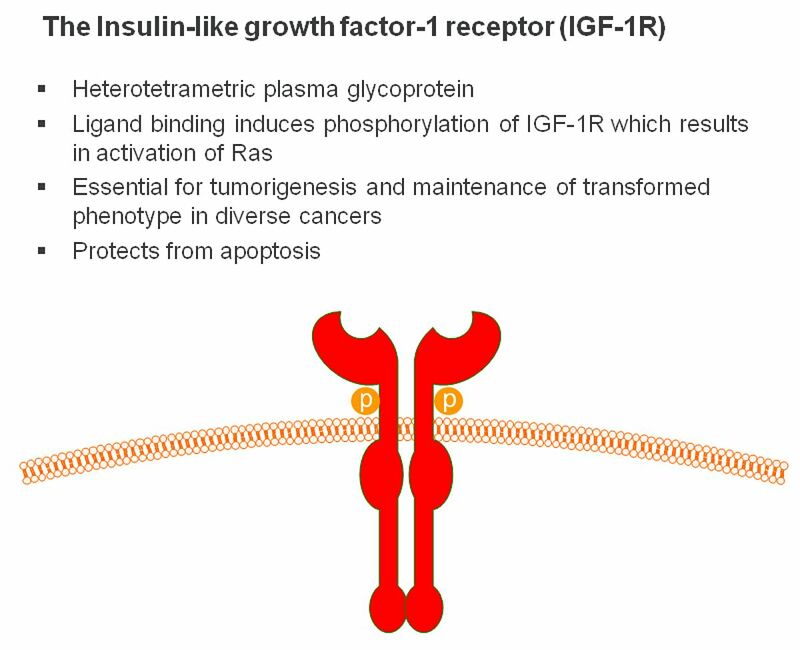 Basic characteristics of the insulin-like growth factor receptor 1 (IGF-1R). Fig 2. 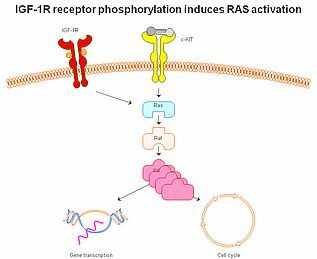 The two tyrosine kinases insulin-like growth factor 1 receptor (IGF-1R) and c-KIT are transmembrane receptors that when activated may drive the MAPK pathway with activation of products downstream of RAS and RAF. 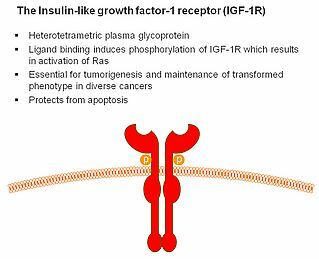 More recently, our interest has shifted to the insulin-like growth factor receptor 1. This is mainly, because this receptor appears to play a major role in the molecular mechanisms of some other rare tumours and, importantly, because it can be effectively targeted by picropodophyllin (Figs 1-2). Experimental studies indicate that this receptor is an independent prognostic indicator in uveal melanoma, suggesting that it plays a significant role in tumour development and seeding. Abundant in vitro data suggested excellent effect on cultured uveal melanoma cells after selective targeting. Bringing it one step further, results from animal models clearly show efficacy without significant toxicity both when used intraperitoneally and when provided orally (Fig 3). However, it still remains to bring this into an effective clinical care for uveal melanoma patients. Unfortunately, strict regulations make this much more complex for a non-approved drug than using off-label treatment with an approved drug. Still, the first results showing 'proof-of-concept' using picropodophyllin in another tumour setting have now been released. Fig 3. 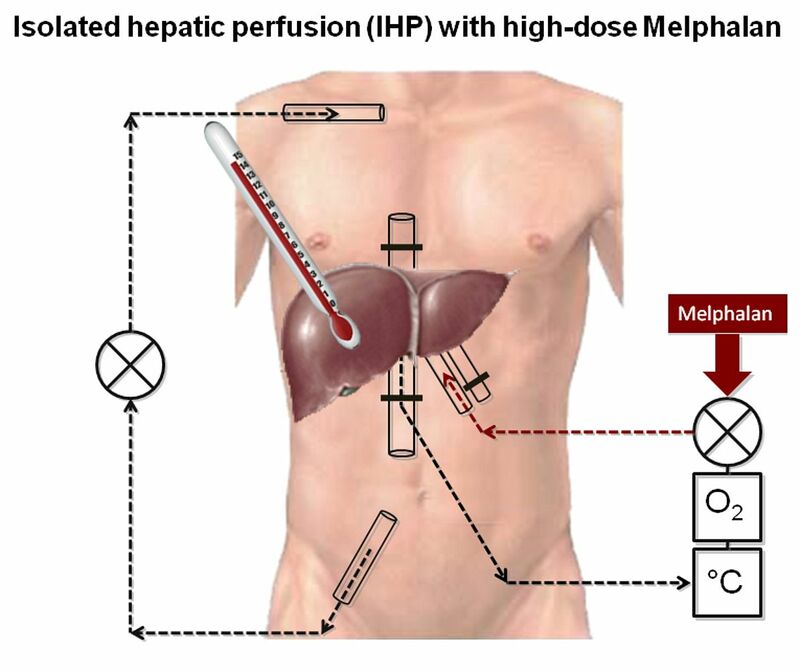 Schematic representation of high-dose melaphalan used for isolated hepatic perfusion with hyperthermia. The surgical procedure is extensive and lasts for approximately 6 hours. Until selective targeting is available, we need to do with a more ‘general’ approach to treatment of widespread disease in uveal melanoma. It would be logical to focus therapy to the liver as this is, almost universally, the first site of detection of uveal melanoma metastases. 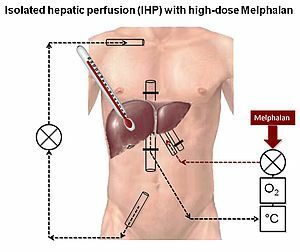 The liver may be isolated from the systemic circulation and cytotoxic drugs perfused at very high concentrations and at hyperthermic conditions. We have used melphalan in this concept in a subset of patients with stage IV uveal melanoma, believed to be confined to the liver (Fig 4). Admittedly, this study was uncontrolled, but patients did surprisingly well with partial or complete response seen in 14/15 patients. Although not curable, some patients survived with disease for up to 83 months after therapy. Interestingly, tumour recurrence was almost always extrahepatical suggesting that extrahepatical micrometastases are present in most patients. Much progress has been made in identifying uveal melanoma patients at high risk to develop metastatic disease. Ideally, these patients should be treated by a minimally toxic therapy more or less selectively targeted to uveal melanoma cells. If individual prognostication is precise enough and therapeutic side effects are acceptable, adjuvant therapy of patients with primary uveal melanoma, but without detectable tumour spread would be warranted. Clinical results would then be expected to be better as tumour burden in these patients would be minimal. Until such a therapy exists it is unlikely that we will see much improvement in patient survival. Fortunately, the time to such a breakthrough may not be all that distant.